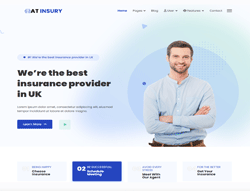 AT Insury is Premium Joomla template tailored for insurance company website. Use a chosen Insurance Joomla Template to easily present your insurance services to clients to help them make the best choices with the help of your company. Competing in the insurance industry can be tough. You will always need to show clients your edge in the best way possible. Your goal is to make sure that clients immediately see your best packages and deals the moment they click into your site. Using the latest design trends, clients will be able to browse through your sites contents one by one, making sure they do not miss a thing. Insurance Joomla template supports mobile / tablet version with 100% responsive layout. All of these will be fully functional in the templates responsive design that fits well into all browsers, including mobile, thanks to cross-browser compatibility. It also builds with latest Bootstrap CSS Framework, Support Font Awesome and K2 extended style. The social options, Google Maps, and contact forms make it easy for the community that your site builds to interact with each other, increasing networks and traction that your company can benefit from. Furthermore, it also comes with 4 colors schemes and boxed layout helping to create professional websites with various layouts. This one will be an amazing choice!